Has President Trump introduced a Trump Put by lashing out about rising interest rates and calling for a weaker dollar? 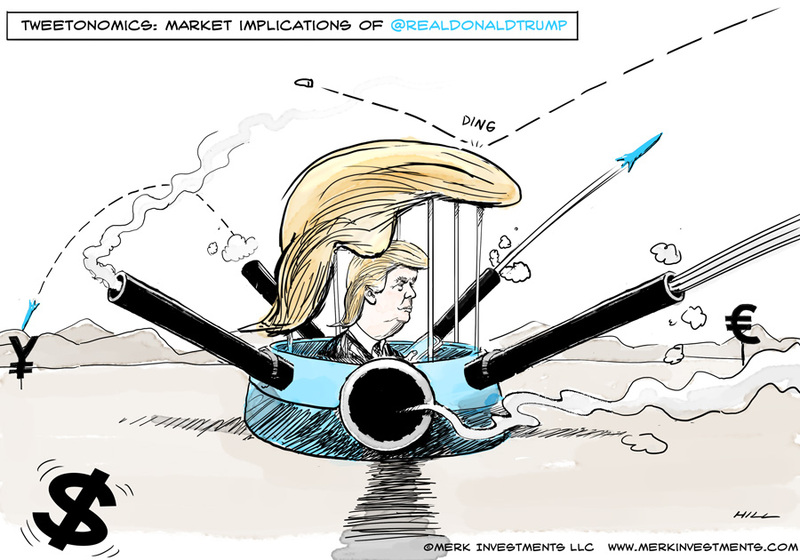 The market reacted swiftly - and rationally - albeit not the way Trump had intended. Let me explain. Trump suggests the U.S. is put at a “disadvantage” given that the European Central Bank and Bank of Japan continue their more expansionary monetary policies. Markets reacted by selling off the dollar versus major currencies. If that were all, you might shrug this off as disruptor-in-chief rattling the currency markets a bit. Maybe there isn’t much more to it. After all, speculators had been bidding up the greenback of late and, possibly, this was as good a catalyst as any to take some profits.1 But that’s not the end of it. First, Mr. Trump appears to favor a weaker dollar and may well provide more verbal intervention should the dollar resume its climb. In that sense, Mr. Trump has introduced Trump put. But why is it that a comment by the President moves currency markets? Partially, this may be because he has shown a willingness to use executive power to interfere with trade. The cheapest form of monetary policy is verbal. If a central banker tells us “rates will be low for an extended period of time,” the bond market will reflect this, assuming that comment is credible. If verbal guidance (think “forward guidance”) is insufficient, the central bank needs to raise or lower rates. In times of crises, lowering rates may be insufficient, and the central bank may need to intervene more heavily in the markets, such as through large-scale purchases of bonds (so-called quantitative easing). As former Treasury Secretary Hank Paulson once said, if you have a bazooka, you may not need to use it. That is, to prove my point: words are “cheaper” than action. Here’s the rub: when politicians start chiming in on monetary policy - especially if it is someone influential who implies policy makers at the Fed could be fired (Trump is “letting them”) - it torpedoes monetary policy, diluting the message of the Fed. As a direct consequence, it is more expensive for the Fed to pursue whatever plan it has. In my view, that is why bonds sold off, yields rose: debt that needs to be refinanced will need to be financed at a higher rate. Technically, Trump could fire Powell “for cause”, but I consider the odds remote. I don’t consider Fed Chair Powell a pushover. Market professionals talk about an ‘increased risk premium’ being priced into the yield curve. Differently said, the dollar just got ‘riskier’, explaining why yields rose, even as the dollar fell. But if Powell is no pushover, does it matter what Trump says in an interview? Isn’t the Fed independent? In my humble opinion, currencies - and monetary policy - are a credibility game. Monetary policy is effective because there’s the general belief the Fed will do the right thing. Anything that reduces this effectiveness is not desirable. Note that the Fed shares responsibility for Trump’s comment. How come? Not because the Fed has raised rates several times and is expected to raise rates further, but because the Fed’s actions since the financial crisis have invited political interference as the Fed has stepped onto fiscal turf: The Fed’s buying of Mortgage-Backed Securities (MBS) is fiscal policy as it allocates money to a specific sector of the economy. The Fed’s paying of interest on excess reserves (IOER) is also a political hot potato, as the Fed is literally paying billions to banks in an effort to discourage banks from lending. Not surprisingly, political attacks on the Fed have increased. 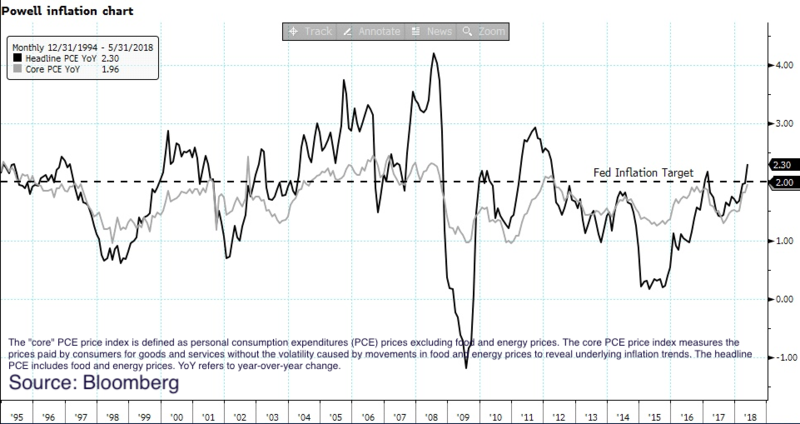 If you look at the chart above, you see inflation is already at the Fed’s target of 2%; some shrug off recent rises in inflation data due to statistical aberrations, but an economic stimulus at a time when the economy runs near full employment may well make it plausible that my scenario is realistic. Many pundits may scream “stop” once the yield curve inverts (when short-term rates exceed long-term rates), but keep in mind the Fed’s mandate is not to prevent the yield curve from inverting. Now put Mr. Trump into the mix. You have an economy that shows strains, yet the Fed continues to raise rates. In such a scenario, I would think it is perfectly plausible to hear more lashing out at the Fed by the President. Will the Fed set different interest rates as a result? Even if Mr. Powell is no pushover, it may be costly nonetheless as Fed policy may have gotten more expensive: more action (higher rates) may be necessary because of the political interference than otherwise would be warranted. And there you have it: a Trump put with unintended consequences. If you are interested in learning how to take direct positions on interest rates, we might be able to be of service click here to learn more. In the meantime, please explore our chartbooks, register for our free newsletter and follow me on LinkedIn, Twitter, Facebook or Patreon. (1) Our reading of the July 20 Commitment of Traders (COT) report suggests speculators had substantial positions betting on a stronger dollar. The report is released on Fridays based on positions in the futures markets by investors classified as speculators the preceding Tuesday.